There’s a new resource for you the next time a client flies in from out of town or for when Grandma Mary decides she wants to “see how you’re doing” for a weekend. 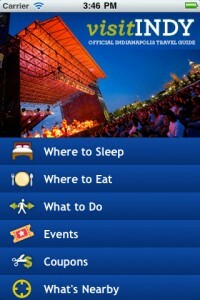 Indianapolis, say hello to your new iPhone app. Brought to you by the Indianapolis Convention & Visitors Association, this handy (and free) guide will tell you where to sleep, where to eat, what to do, highlight events, share coupons and tell you what’s nearby, according to The Indianapolis Star. That seems like a no-brainer, considering that Apple boasts more than 25,000 applications for the iPhone, with more than one billion iPhone apps downloaded. According to the article, the free app will be available for the iPhone and iPod Touch, with an Android app and iPad-specific app on its way. Designed by the ICVA marketing team, it’s designed for both tourists and local residents. 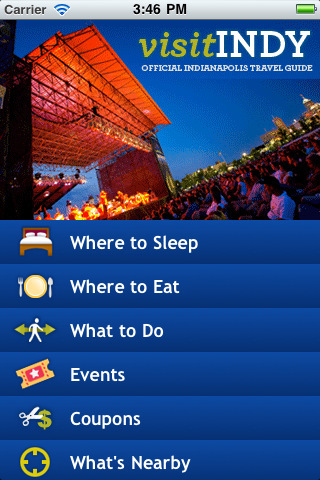 What makes the Visit Indy app even cooler is that it integrates Augmented Reality or AR. It uses your smart phone’s camera to show you where things are that you’re looking for. So, when you launch AR, you simply hold up your phone and icons will appear that indicate where a restaurant in front of you is located. Pretty cool, right? This is no doubt a terrific way to show out-of-towners how tech savvy we are with the adoption of a booming trend, as well as show them how proud we are of our great city. So if you have a smart phone, download the app and let us know what you think!